Bronchoscopy - a study of the trachea and bronchi with bronchoesophagology (see). 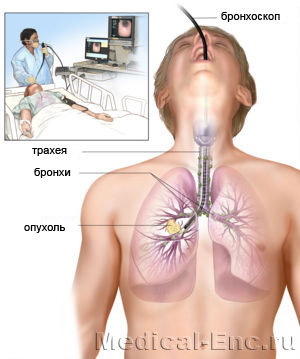 Bronchoscopy is a diagnostic (suspected cancer trachea, bronchus and lung, some forms of tuberculosis, foreign body of the trachea and bronchi, assessment of bronchus stump after operations on the lungs) and treatment (removal of foreign bodies, pathological content when bronchiectasis, abscess and others). The method of administration bronchoscope distinguish upper bronchoscopy (introduction through the mouth) and lower (introduction through a tracheostomy). Because examine first the trachea, bronchi and then, this procedure can be properly called tracheobronchial. Bronchoscopy is performed under local anesthesia and under anaesthetic (by connecting a special bronchoscope with the anesthetic apparatus) on an empty stomach or 4-6 hours after a meal. Before a bronchoscopy nurse (or nurse) prepares tools, makes the patient injections of narcotic drugs. During bronchoscopy one assistant gives the doctor the necessary tools, another puts the patient on a special chair or puts him on the operating table, locking in position. The use of anesthesia and special procedures created the possibility of applying the upper bronchoscopy children of any age. With the help of special devices can be produced photo - and filming found during bronchoscopy changes in the respiratory tract.